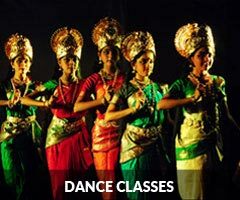 Activities | Shree Mookambika Cultural Academy Reg. Apart from cultural scenario Sri Mookambika Cultural Academy has also conducted many social oriented programmes like planting trees in schools like Balavikasa school and Government Higher Primary School of Mani and temple premises of Sri Mahalingeshwara Temple Puttur, Anti Plastic Campaign in the premises of Mahathobhara Mahalingeshwara Temple and Darbe of Puttur, and distributing plant saplings to the students in very personal level to the students of the institution. Along with this, the institute arranges Lecture demonstrations on Indian Culture and its moral values, conducting workshops on learning the inner core of Natyashastra like ‘Natya –Chintana’ and various certificate courses in collaboration with Nupura Bhramari Trust(R.). Sri Mookambika Cultural Academy is an institution of family of artistes with Vidwan Deepak Kumar as Director, his Father D.Bhavani Shankar as correspondant, Vidushi Preetikala as director of music department and Vidwan Girish Kumar as the co-ordinator of dance department and Smt Shashi Prabha as costume designer and also co-co-ordinator.